New Jersey may have been the battleground state that championed the federal legalization of sports betting, but due to recent developments it may not be the first state other than Nevada to offer it. While the Garden State had originally planned to begin taking sports wagers on Memorial Day (May 28), it was announced that those plans would be delayed as the legislation is under review. Now Delaware, a state that already had a conditional exemption from the federal sports betting ban, could potentially swoop in and beat New Jersey to the punch. Even before the Supreme Court of the United States struck down PASPA, the federal ban on sports betting outside Nevada, Delaware had a unique relationship with national gambling law. Sports betting has technically been legal since 2009 in the state, although citizens have only been allowed to place parlay-style wagers on NFL football. 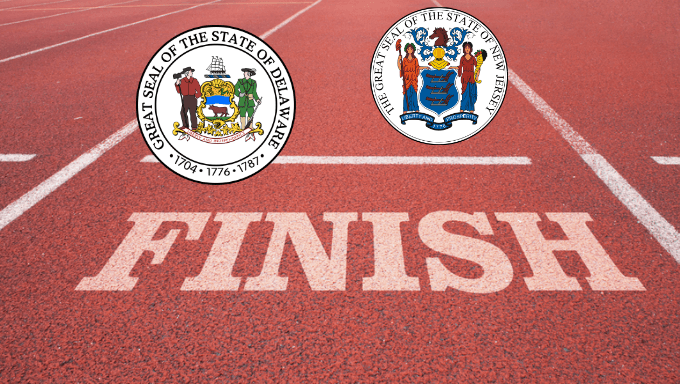 Along with Nevada, Oregon and Montana, Delaware was one of the only states to have sports betting legislation on its books when PASPA was adopted back in 1992. With this allowance already entrenched in Delaware gambling policy, it is expected that the SCOTUS ruling will serve to expand legislation that currently exists and thus shouldn’t need much reworking if any to be enacted. An official statement by the state’s Department of Finance and Attorney General’s Office clarified this assertion. State Finance Secretary Rick Geisenberger echoed these sentiments and said that the state is confident it already has the legal and regulatory authority to authorize sports gaming. Local newspapers tout the official start of sports betting in Delaware somewhere between the first week of June and the end of the month. This window puts the state in a dead heat with New Jersey thanks to a presumably brief setback imposed by its government. Just to the north of Delaware, Monmouth Park Racetrack CEO Dennis Drazin is more than a little disappointed. The racetrack was primed and ready to open New Jersey’s first legal sportsbook, The William Hill Sports Bar, due to Drazin’s foresight and initiative. Drazin has personally invested millions of dollars into the project, but now can only wait patiently for the state Assembly and Senate can establish sports betting regulations. Per a request by Senate President Stephen Sweeney, Drazin was asked to delay the acceptance of bets until June 7 at least. The extended review by the state’s government is especially frustrating because of the long seven-year fight it underwent just to get the case before the Supreme Court. Now that victory has finally been achieved, the later start is understandably putting a bit of a damper on the parade. A ceremonial opening involving sports wagers for charity is scheduled to take the place of the original event. Among the guests will be a host of figures who contributed greatly to the ruling including former senator Ray Lensiak, Gov. Phil Murphy and former Gov. Chris Christie. While the holdup is disheartening, Drazin is confident that many are likeminded on the issue and the legislation won’t face much opposition once finished. A little further north in Rhode Island, global gaming company IGT is expected to launch sports betting soon. It’s currently the only company to submit a bid for tending sports betting in the state and has a familiar history with its lottery. IGT has worked with the lottery to run its electric systems and under the new agreement potential agreement would be expected to set odds and run betting technology in the background of the state’s potential betting industry. Paul Grimaldi, a Rhode Island lottery spokesman, was disappointed with the lack of interest from other companies, but the IGT bid has nevertheless been passed on for review.